Coffee Fest trade shows are produced to help coffee and tea retailers compete and prosper in the marketplace. Each show features a complete exhibition, as well as educational and networking opportunities.Coffee Fest has been serving the specialty coffee and gourmet tea industries since 1992. 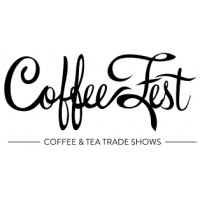 Viewed by most as the best tradeshow both nationally and internationally, Coffee Fest is specifically for those involved with retailing coffee, tea and related products. Coffee Fest continues to evolve and stay at the forefront of emerging trends.If it looks like coffee, smells like coffee, goes well with coffee or is coffee, you are guaranteed to find it at Coffee Fest. Everything under the sun that would be found in an upscale coffee shop, on either side of the counter (including the counter), would be found on the exhibition floor at Coffee Fest. The best coffee retail education, training and workshops are also found at Coffee Fest. Check out our website for specific information about attending or exhibiting at an upcoming Coffee Fest Show.For the freshest, most energized and rewarding experience, mark your calendar now and make plans to come to what has arguably become America's most vibrant coffee market.